Due to arrive this week, just nine months since the release of the acclaimed Juliana Hatfield Sings Olivia Newton-John, is the acclaimed singer-songwriter's seventeenth studio album, Weird. Where her true singularity lies is in the dust-up, bumping each of Weird’s songs around in unexpected directions with crunchy guitar solos (the blown-speaker buzz effect she achieves on “Lost Ship” is particularly great), purposely constructed to reflect Hatfield’s mindset while recording the album. 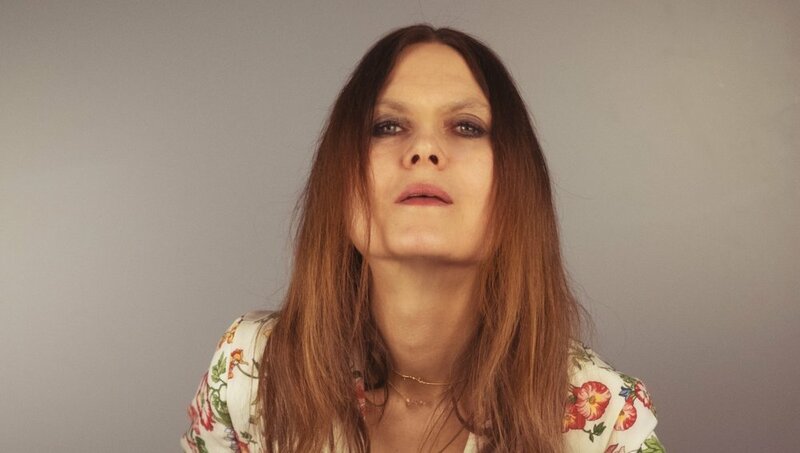 While she insists there isn’t much artistic connection between Juliana Hatfield Sings Olivia Newton-John and the new album, they each give Hatfield’s listeners similar gifts by a complete lack of pretention and an abundance of honesty. As a portrait of an artist, Weird is about as authentic as it gets. Grant Walters: You and I last spoke just after Juliana Hatfield Sings Olivia Newton-John was released. What transpired creatively after that project that led you toward this new endeavor? Juliana Hatfield: Yeah, I guess I’m always sort of thinking about the next thing. As soon as I’ve got something done, I’m already thinking ‘what’s next?’ The older I get, the faster time goes, so I don’t want to stop, anymore. I feel like there’s no time to stop and relax. I mean, I relax a lot, actually. I consider myself really lazy. But, two albums in a year’s worth of time—to me, that’s not a whole lot of songs when you think about it, twenty or twenty-four songs, or something. GW: There’s been a palpable reaction in the press I’ve read, maybe even a bit of surprise, that you’re releasing two new full-length albums in the same year. I guess by today’s standards that’s a bit anomalous. JH: I think it’s because the perception is based on the old days when, you know, there were record labels and there was a machine to promote the records, and you just needed time to “set up” an album, then promote it, go on tour. And it took a long time to write. But, yeah, like I said, I just like to keep busy and keep going. Since I’m not touring as much anymore, I have more time to write and record, and after the Olivia record was done, I went back and just started listening to old tapes—I have a lot of cassettes with song ideas on them. And I just started from there, picking out some old riffs and writing more riffs, and starting from a base of that and putting songs together. I started recording with a couple of drummers, and then I took a month or two off to write lyrics. GW: You seemed so inspired and elevated by the Olivia covers album, and we previously discussed at length how you admired her interpretive ability and John Farrar’s songwriting. Did reimaging someone else’s songs reshape your own compositions or performance in any way on Weird? JH: The answer’s kind of no, at least not as much as you might think. As soon as I went back to writing, I just kind of fell back into my old habits. I feel like I just have this thing that I do, and it just sort of is what it is, and I can’t alter it that much. Which is weird, because I feel like, in a sense, I’m sort of not evolving. I have this knack for this certain kind of song, and I’m continuing on the same path I’ve always been on. GW: I was going to ask about that song specifically because I really love the guitar work you did on it. JH: I really think that sound was inspired by [their] album. I was inspired to be a bit more experimental with the guitar sounds and with some of the volume—just pumping things up a bit more than I usually would. GW: Are there subjects or aspects of your life you find harder to talk about now versus when you first started your career. Or, conversely, do you find it easier to be revelatory about certain things at this stage? JH: I find that now I have more restraint, and I wish I’d had more in the past. I think I gave away way too much detail. I was too open, too vulnerable, too earnest, too intimate with the details of my life, and I’m almost ashamed and embarrassed about some of that. I mean, I’m proud of it all, but I feel like I was just an open wound and I feel like it was more of a diary entry back then, and now I’m making better choices and crafting things with a little more artfulness. I'm choosing my words a lot more carefully, now, and I think that’s a good thing for me. I think I probably let out too much. GW: So, as you move from concepts or ideas for songs, what process do you follow to commit them to a fully realized recording? JH: It always starts with me alone in my apartment with my little cassette recorder or now my little iPad Mini. Sometimes I record video now, just so I can remember the chords, because sometimes I can’t remember how I played weird chords, so it’s good to have visuals. It’s just a process of me messing around, and sometimes I’ll come up with some chord progressions, I’ll try different tuning, and then it’s just a lot of time going through a lot of pieces and parts and trying to see what’s good and what works. And then it’s adding to stuff I like, and really just building stuff up and making a lot of choices—‘what do I like? What works?’ It’s like crafting something from nothing. It’s a craft experiment. This time I went into the studio early, before I had lyrics, and I got a couple of different drummers and recorded some stuff, and then I started adding on. Neither of the drummers lived in town, so I just had them come in and it was great of them to be able to work with songs that weren’t really totally written. They just had these really crude demos to listen to, and then it was finishing up the structures in the studio. They didn’t really know what they were playing to because they didn’t have much to go on. GW: Do you consider yourself to be a tinkerer when you’re in the studio? JH: Well, the bottom line is that I can’t really mess around much, because financially, the studios I work in lately...it’s not cheap. And I can’t just go in with an attitude of ‘ah, I’m just gonna mess around!’ I can’t be so perfectionistic. I’m not trying to achieve any sort of perfection. I’m just trying to get to a place where everything’s working, where everything’s clicking, and not trying to get too much further than that. Because I think you can overwork something past the point of doneness. I like to get in there and be able to mess around a little bit. I don’t have every single part worked out when I get in there, because I like to work in a state of only half-consciousness, so I can let unconscious ideas bubble up. I like to let accidents happen, because sometimes the best ideas are accidents. I and the engineer both have to be ready to pounce on something that sounds great—something unexpected. I don't mess around too much with the song structures—a little bit. But once I have the skeleton around it, and after the drums, I’ll start playing some bass or some guitar, and then it builds up. Sometimes I hit a roadblock and I can’t figure out how to make something work, but then I’ll just leave that, and I’ll come back to it. As soon as something is clicking, I don’t like to work it to death. I’m very good at leaving stuff be, and never going back and not worrying about it. I like to move on. GW: There are a lot of reasons why I’m not a recording artist, but if I was, I’m convinced I’d never leave the studio because I’d want to play around way too much. JH: I mean, I am the boss, right? So, I don’t like to have a lot of people weighing in with their ideas and opinions, so a lot of the circuit was just me and the engineer, James Bridges. And he has really good taste and was a great help to me, because there were moments where I’d go ‘oh, this guitar solo needs to sound fuzzy, but also like it’s breaking up and like it’s on a satellite,’ And he’ll go, ‘oh, yeah,’ like the ‘The Lost Ship’ solo. He just plugged it straight into the pre-amp on the board, and that was the sound. He totally understood what I was trying to transmit to him about the sound. I’ll just say a few words to him, and he’ll dig out some pedal and it’ll have the effect I was looking for. I’m not a perfectionist in terms of having a clear vision, and then cracking the whip on everyone until I get what I want. It’s more like I have a vague idea of what I want, and I don’t always know how to achieve the vision. But, somehow, I can find what I’m looking for by scraping and scratching to get there. GW: Speaking of “Lost Ship,” I wanted to mention how great I think the video is for that song. It’s got this really serene, lovely vibe that’s such a cool juxtaposition to the industrial structures you can see in the background. JH: I’m really happy with it. It’s a mixture of science fiction and nature, or something organic sci-fi and I’m like an alien landed on this planet. That’s what it seems like to me. I like that Rachel Lichtman, the director, listened to the whole album and we weren’t sure what song we were going to make a video for, and she chose it. She thought that it was a very positive song about empowerment in terms of solitude being a position of strength and freedom. I thought that was great, because I thought the song was going to come across as sad in the way of that in the song, I want to escape. But Rachel was able to focus on the freedom of escaping into ideas and into the visions in my mind. GW: Yeah, I really like that message. Because I think we often get fed the idea that your self-worth depends on your life constantly being filled up with people and material things, or that you always need to be fully engaged in the world to be happy. Our society seems to dictate that it's never okay to be unplugged and to find satisfaction in being by yourself. JH: Or to choose to be alone. People still are really threatened, I think, by someone who, after a certain age, chooses to be that. I think it’s weirdly threatening. And I feel that coming from people sometimes, and it makes me feel really uncomfortable because my choice to be alone shouldn’t be threatening to anyone else. Maybe it’s a threat because other people just don’t know to be alone. Or they’re not self-sufficient, or they freak out when they’re alone, so they don’t understand someone who finds comfort and freedom [in it]. GW: I read an interview you did for The Wall Street Journal last year, and in the sub-heading it referred to you as a “cult favorite.” I was wondering how you feel about that? Does that reflect how you see your success or trajectory as an artist? JH: I think “cult favorite” sounds pretty good to me. I mean, it’s better than being called a failed pop star. It's better than that. It’s better than being called someone whose sales were disappointing, or a has-been. “Cult favorite” sounds great to me. I’ll take that. It’s better than other things I’ve been called or have been told I’ve been called—I don’t really pay attention to it. GW: I get that, sure. And that wasn’t a loaded question, by the way. I was genuinely curious how that might be seen through your eyes. JH: For me, I think it means I've gotten to a point where some time has gone by, and I’ve earned a spot in some place where I’m allowed to do my thing and it will be accepted by the people who accept it. GW: In the spirit of Albumism, what are your five favorite records of all time? JH: Five albums of all time? Five favorite albums of all time. Well, one album that was very important to me at one time when I was a very young, impressionable music-maker was Dinosaur Jr.’s You’re Living All Over Me. That was a really important album in my life. It’s really impossible to name five albums. Jesus! Okay, let’s just say Carole King’s Tapestry, although I don’t know if that’s the truth, but let's just say that. She’s just one of my favorite singers. I love her voice so much and, yes, obviously she’s a great songwriter and she’s known for that, but her voice is just so unique for one thing, and it’s organic and scrappy but also masterful, and I just love the combination. I should probably have an X album in there. Maybe More Fun in the New World? What’s that...one, two, three? This is hard. How about The Beatles’ White Album? And then maybe...let’s just say the Saturday Night Fever soundtrack. That’s not really a true list, but let’s just say those are five albums I really like a lot.